UCLA was supposed to be a sleeper team in Rick Neuheisel’s second season as head coach, but the Bruins didn’t look very good last week in a 31-22 loss at Kansas State. The Bruins' rebuilt front seven surrendered 313 yards rushing to the Wildcats. And on offense, QB Kevin Prince completed just 9-of-26 passes for 120 yards with two interceptions. If there was one bright spot it was that Bruins kicker UCLA's Kai Forbath kicked three field goals and ran his streak to 40 in a row from inside 50 yards. Stanford entered the AP poll this week at No. 25 after roughing up FCS school Sacramento State, 52-17. Andrew Luck, arguably the best pure passing quarterback in the country, was brilliant in going 17-for-23 for 316 yards and four touchdowns. The Cardinal didn’t miss Toby Gerhart much as a running-backs-by-committee rushed for 213 yards. But, again, consider the competition. Prince is expected to start Saturday night despite a banged-up shoulder that caused him to be limited in practice most of this week. Last week, he worked through the week as he pushed to get ready for the opener after a torn muscle in his back kept him out nearly three weeks. Thus, maybe that contributed to his lousy performance. If for some reason Prince can’t go, the job falls to backup Richard Brehaut, who's seen plenty of action in practices due to Prince's inaction. Meanwhile, Stanford has some injury issues. Starting tight end Levine Toilolo, a redshirt freshman, is out for the season as the result of a knee injury he sustained on the second offensive play of the opener. Running back Jeremy Stewart, wide receiver Chris Owusu (one of the nation’s best kick returners last year) and starting inside linebacker Shayne Skov are all day-to-day with various injuries. Owusu and Skov missed the opener, but Coach Jim Harbaugh thinks they can play against the Bruins. Stewart had five carries for 21 yards before leaving with an ankle injury. 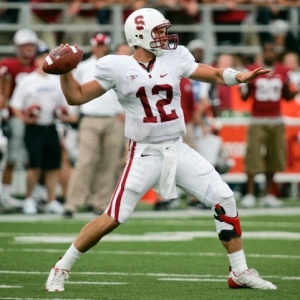 Last year Stanford won 24-16 at home; the Bruins’ Prince didn’t play in that game due to an injury. That snapped a five-game Bruins win streak in the series. UCLA has won the last six games in the series played in the Rose Bowl, dating back to the 1996 season. The Cardinal are six-point favorites with the total at 52.5. The line opened as high as 8 at some books and as low as 6.5 at others. It fell to as low as 5 at many books. Currently about 70 percent of the action is on Stanford. UCLA was getting about half the money when the line was at 7 or higher. The total has risen only about a half-point. The key player for UCLA on Saturday, other than Prince, probably will be safety Rahim Moore. He led the nation with 10 interceptions last season and will be a key to preventing big plays through the air. He only played the first half in last year’s loss, leaving with concussion-like symptoms. Vegas Sports Informer has a college football handicapping goal of putting up +150 units for his NFL and college football picks for 2010-11. And the way he has performed in baseball and WNBA this summer, it could get a lot better than that. He had a very nice start to the college football season with a 5-1 performance in Week 1. Find out why this Vegas insider is terrifying the bookies in Sin City and across the globe. Click Here for more information on his picks..